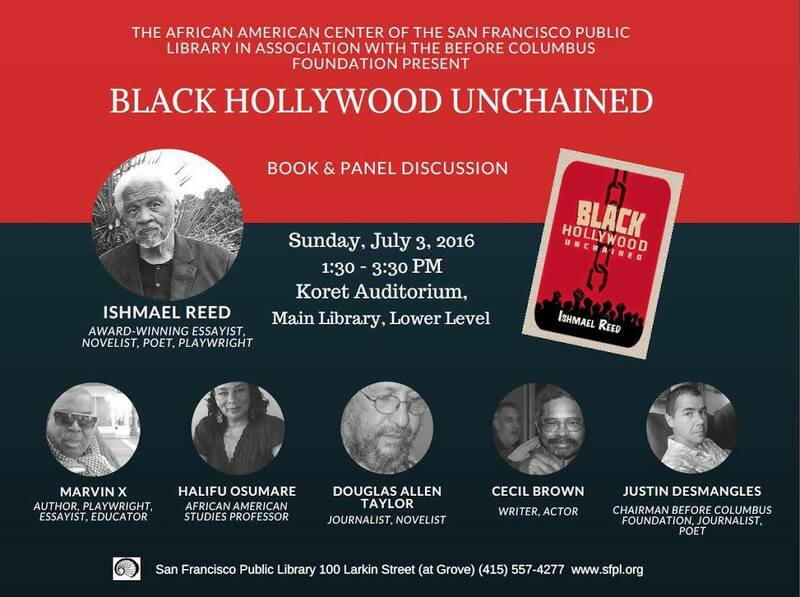 Location: Koret Auditorium (Lower Level of the San Francisco Public Library) 100 Larkin St.
Ishmael Reed discusses his recent book, Black Hollywood Unchained, which features essays from scholars, critics, intellectuals, and artists who examine contemporary portrayals of Blacks in films and provide a critical perspective on the challenges facing Black filmmakers and actors. 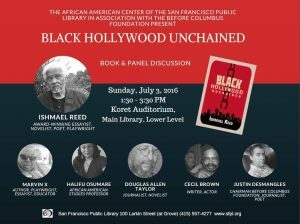 Ishmael Reed will be joined by Black Hollywood Unchained contributors Dr. Halifu Osumare, Marvin X, Cecil Brown, Jesse Allen-Taylor, and Justin Desmangles. American Book Award recipient Robin D.G. Kelley on the passing of Cedric J Robinson. Ishmael Reed writes for the New York Times about the life and legacy of the Greatest, Muhammad Ali. Johnnie Burrell interviews participants at the 2016 Oakland Book Festival, including Before Columbus Foundation board member Justin Desmangles, Activist Musician Boots Riley (of The Coup), and American Book Award recipient Frank B Wilderson III, among a great many others. John Keene, Emily Raboteau and Victor LaValle discuss Multiracial American Literature in the 21st century. Panel hosted by Justin Desmangles, Chairman at Before Columbus Foundation. Michael Eric Dyson and Hisham Aidi (recipient of 2016 American Book Award) discuss the Legacy of Malcolm X. Hosted by Justin Desmangles, Chairman at Before Columbus Foundation.